Dentists call natural looking white fillings posterior composites. 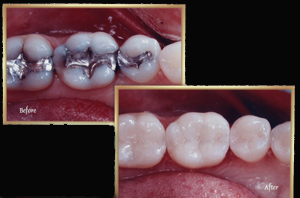 Mercury silver fillings have the disadvantage of being metallic looking and turn black as they age. If your goal is to create an incredible smile you will probably want white fillings to help create your esthetic and beautiful smile. White fillings contain no mercury and once placed into a tooth, they are almost invisible. They're beautiful. If your teeth aren't the color you would like them to be, we can whiten ( bleach ) your teeth and then match the color of your newly whitened teeth with natural looking white fillings. Most white fillings are placed directly into a tooth and hardened right after the dentist prepares a tooth. In another white filling technique, called indirect white fillings, we make a model of your tooth and the laboratory makes a porcelain filling. The porcelain fillings are stronger and smoother and last even longer due to their hardness and improved strength. White fillings also look great in the front of your mouth. White fillings can even be placed onto the surface of your tooth using a dental technique called bonding. Bonding allows us to mold beautiful smiles like artists mold clay statutes. 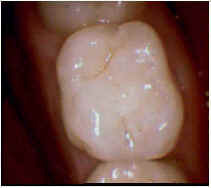 After we are sure the white filling looks great, it is then hardened using a dental curing light. 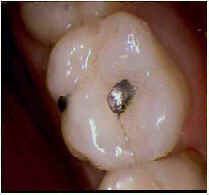 When the light is placed close to the white filling material, the white filling material begins to chemically change and harden. If you are considering having white fillings done to improve your smile and your goal is to look great, you should seriously consider scheduling a Cosmetic Consultation exclusively aimed at discussing what you want in your beautiful smile. If you are interested in white fillings and would like to speak with us about how white fillings can be used to create a gorgeous smile for you then call (408) 578-5595 to schedule a Cosmetic Consultation.